With the mission to inspire conservation leadership by connecting people with wildlife and nature, the Chicago Zoological Society does just that on a daily basis. 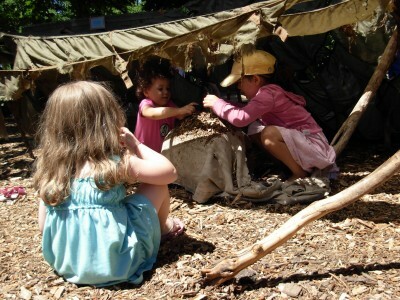 Adding a Nature Explore Classroom has brought their mission a step further by allowing children and families to engage in nature-based play opportunities. Each of the areas included in the Nature Explore Classroom supports a unique approach to discovery and exploration. Visual clues and signs communicate options and ideas for play and exploration yet supports choice and creativity while engaging with natural materials. 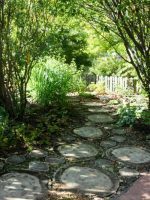 There are opportunities for building and construction, sensory play and ephemeral art, climbing and moving, gardening and caring for plants, or quiet discovery and investigation. 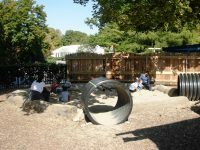 It is important to provide a variety of spaces in the outdoor environment for play opportunities that meet the interests of the many children who come to visit. The richness and diversity of play in the outdoors support these interests. 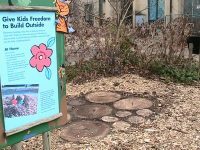 Tall grasses, a willow caterpillar, crawl-through tunnel, and bushes provide children with areas they feel “hidden” while still being in view. Sand, gravel, wood chip, dirt, grass, and tree cookie flooring are incorporated throughout the Nature Explore Classroom. “Nature boxes” filled with a variety of items invite exploration with natural materials as well. The Grounds Crew from the Brookfield Zoo maintains the space, selecting locally grown and native plantings and durable, low-maintenance natural materials. Items are checked and refreshed as needed. In-ground plants, as well as placed-pots, reflect seasonal colors and textures. Children have access to touch, smell and be up-close while investigating their surroundings. Children are able to participate in activities that help them see their connection to wider aspects of nature. 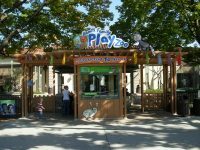 The Zoo reaches out to families by publicizing special events through a variety of media including the web, e-mail, posters, map inserts and zoo staff. Families are invited to planting and harvest weekends, watering and caring for plants, cutting browse to feed animals, ladybug releases and other events. Families may participate in daily activities or on a less frequent basis. 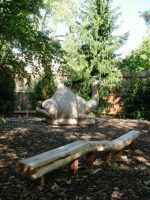 The Nature Explore Classroom allows Brookfield Zoo to help bridge the gap between children and nature and helps children to foster a stronger sense of caring for nature and animals while they play.